A group of students of all ages with their teacher are outside posing for the photographer. 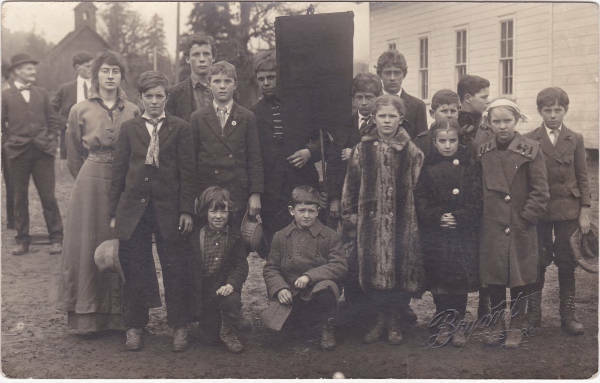 One of the students in the back row is holding a sign on a post with Lyda School printed on a cloth covering the signboard. There are a couple of men standing in the background and behind them is a church. 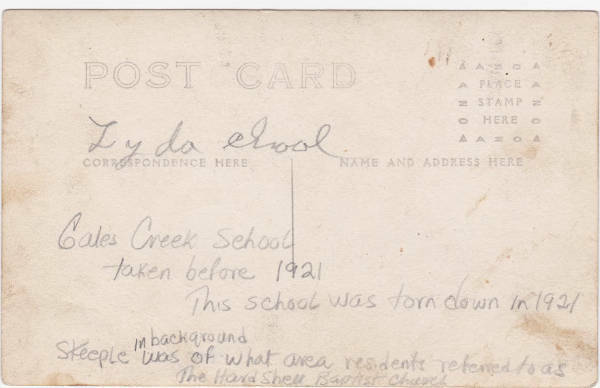 [back] [pencil] Lyda School; Gales Creek School taken before 1921. This school was torn down in 1921. Steeple in background was of what area residents referred to as The Hard Shell Baptist Church. Online access to this image is for research and educational purposes only. To inquire about permissions, order a reproduction, or for more information, please contact Friends of Historic Forest Grove at Friends@FGHistory.org.